Albert and Bernard just become friends with Cheryl. So When is Cheryl's Birthday? 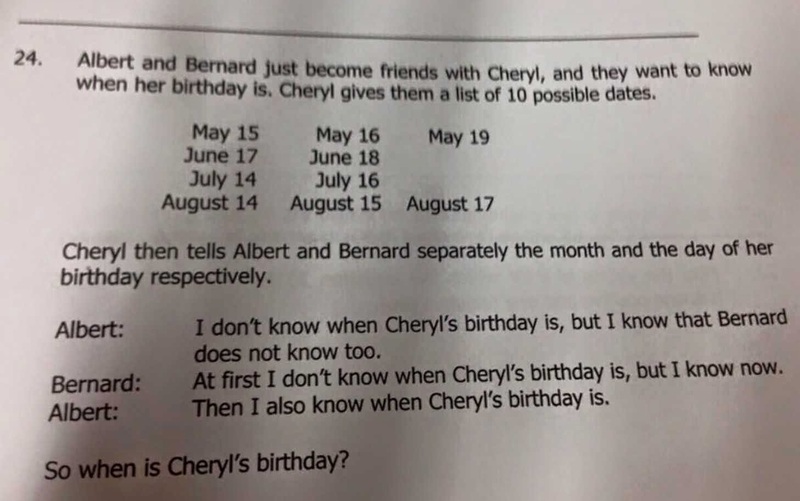 Albert and Bernard just become friends with Cheryl, and they want to know when her birthday is. Cheryl give them a list of 10 possible dates. Bernard: At first I don't know when Cheryl's birthday is, but I know now. Albert: Then I also know when Cheryl's birthday is. A math problem from Singapore SASMO Exam goes Viral !! I will try to help you understand the answer. It is important to note that Albert and Bernard both know the answer before we do. We still don't know whether it is July 16, August 15, or August 17. However, since Albert (who was only told the month) is able to state that he also knows the birthday, he must not have been told August. Had he been told August, he would be unable to decide if Bernard was told the 15th and 17th. It is only after the third statement that we (as outsiders) can deduce the birthday. Bernard knew after the first statement and Albert knew after the second.